A truly interesting mammal! The Robinson’s Mouse Opossum is one of the Neotropics marsupials—a primitive group of mammals found in the Americas and Australia. It is relatively large for a mouse opossum, with a body length of 11-20 cm and a tail up to 21 cm, approximately the length of its body. Males are usually larger than females. It has cinnamon brown upperparts and creamy underparts. It has dark eye rings (a characteristic of most mouse opossums) that do not extend to the ear. It has large, unfurred ears and a prehensile tail covered in fine hairs, brown in color but appearing naked. 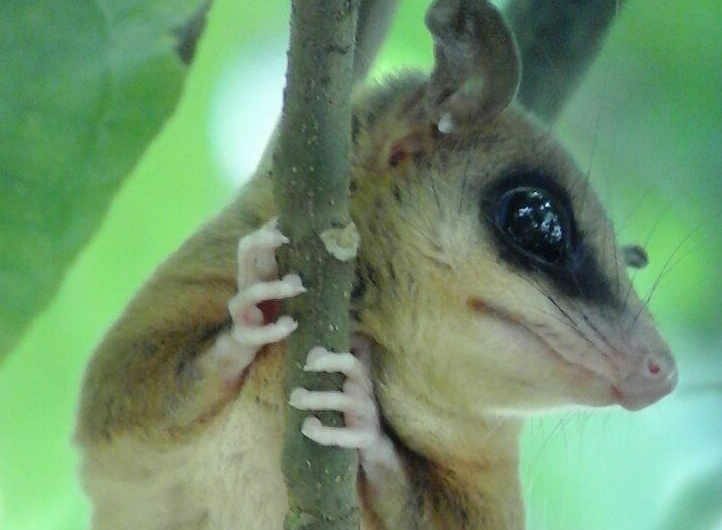 The Robinson’s Mouse Opossum is both terrestrial and arboreal. It is found in forest, forest gaps, secondary growth and edge habitats. It can be found from lowlands up to 2600 meters in elevation, but usually occurs below 500 meters. It is nocturnal, solitary and nomadic, and forages and feeds on fruits, insects and small vertebrates. It nests in tree cavities, bird nest boxes or in abandoned bird nests. It makes a nest with leaves and grass. When not nesting, it rests during the day in any available shelter. Being a marsupial, Robinson’s Mouse Opossums have a short gestation period of only 14 days. The female gives birth to 6-15 tiny (only 12 mm at birth), underdeveloped young, which climb to the mother’s mammae and remain there for several weeks. The Robinson’s Mouse Opossum does not have a pouch like some other marsupials. The young remain attached to the mammae for ~ 30 days, open their eyes at 39-40 days, and are completely weaned by 65 days of age. They reach maturity at about a year of age, and have a short lifespan of only about a year; it is uncertain if they reproduce more than once. In Panama, young are born between April and September. Small mouse opossums may be confused with some rodents due to their mouse or rat-like appearance. In the field, they can be distinguished by their prehensile tail and eye rings. In the hand, they can be further defined by their opposable big toe and their teeth (small incisors, no gap and large canines). They are generally silent, but will hiss when threatened. The Robinson’s Mouse Opossum is found in western and central Panama, as well as in the Pearl Islands. It also ranges in Colombia, Venezuela, Trinidad & Tobago and Grenada. In August, a Robinson’s Mouse Opossum was spotted with several young in tow at the Canopy Lodge. A great mammal sighting!